carpe factum: accomplishment integration management carpe factum: See Spot. See Spot Vote. See Spot. See Spot Vote. We've all been there. You've just led a very challenging group through an arduous brainstorming process. 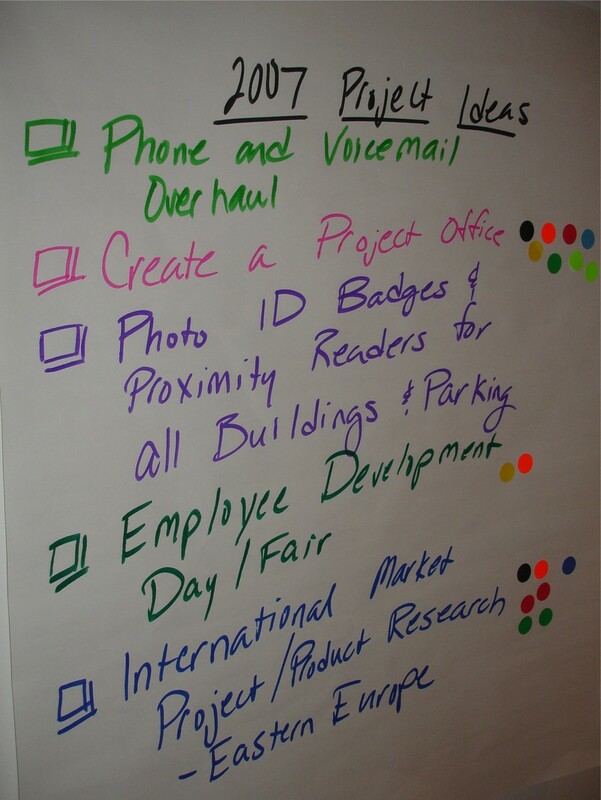 Lots of ideas have been thrown up on the wall (because, in brainstorming, there are NO bad ideas). You've gone through the list and discussed them, having merged similar items on the list. Now your mouth has gone dry. Beads of sweat are breaking out on your forehead. Your palms are clammy. You feel faint. It's time to vote on the list. The bully - mantra is "my way or the highway"
So what do you do? A show of hands? Yeah, like that's going to work. Not with this crowd. Written ballots? One person, one vote... nah, too linear. Discuss the list, simply for clarity and for combining "like items" - NOT for critiquing. Ensure that everybody understands each item on the list BEFORE moving on to the following steps. Count up the number of items on the list and divide by three. This is how many dots (or votes) each person receives. For example, if you brainstormed 60 items, then there will be 20 voting dots given to each participant. If possible, assign a color to each person. Some facilitators like to give everyone the same color to keep things anonymous. I prefer accountability over anonymity any day. Once everybody has voted, review and discuss the results. They may surprise you, but frequently, this exercise gives a clear view of how the group feels about the list. This is not rocket science, and many who read this blog may have already tried a similar approach. It's a simple way to keep your project moving forward while keeping office politics out of the way. While there is software available to vote and rank order, this is a low-tech-high-touch technique which facilitates two of the most important elements of carpe factum: communication and decision-making. I would add an additional step just before voting, though: take some time to think. After the initial brainstorming session, give everyone a copy of the list and send them away. Let them absorb the ideas, even unconsciously. Then, meet again the next day for additional insights and voting. Very good build, Lidor. It's amazing how we let urgency dictate our decisions instead of making our decisions drive our urgency. Sleeping on an idea or thought is a brilliant approach.